A rooster man is living in a town. 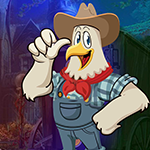 The rooster man is very trivial and playable too. The rooster man went to the game one day and got into a palace. It is your duty to save that rooster man from there. It will be helpful to find the playing hidden there and save the rooster man from there. It will help you to find clues hidden there to save him. Where the hidden clues and puzzles are hard to find, it's anxious to find somehow. This game can easily identify the colors and numbers. Through this game the mind gets peace and enhances knowledge. All the spots are detecting and the rooster man rescued from there and congratulations you win the game. Good luck and have a fun !